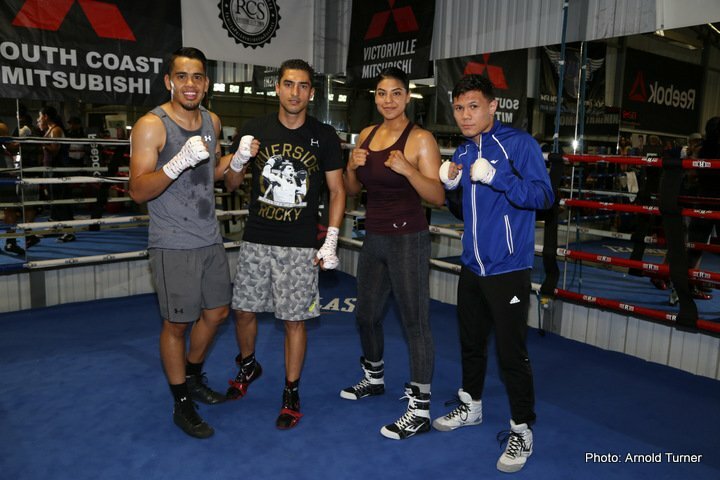 Southern California-based fighters Josesito Lopez, Alejandro Luna, Misael Rodriguez and Maricela Cornejo hosted a media workout at the Robert Garcia Boxing Academy in Riverside Wednesday ahead of their bouts this Sunday, April 9 from the Novo at L.A. Live in downtown Los Angeles. Premier Boxing Champions on FS1 and FOX Deportes action is headlined by the former title challenger Lopez taking on Mexico’s Saul Corral in a welterweight matchup. Televised coverage begins at 9:30 p.m. ET/6:30 p.m. PT and features the unbeaten Luna facing former title challenger Andrey Klimov and the pro debut of 2016 U.S. Olympian Karlos Balderas. Tickets for the live event, which is promoted by Ringstar Sports, are priced at $30 general admission, $60 balcony reserved, $100 VIP balcony reserved and are on sale now. Tickets can be purchased through AXS.com HERE. The 2016 Mexican Olympian and bronze medalist Rodriguez and the former title challenger Cornejo will both enter the ring in separate undercard attractions. “First thing is that I can’t look past my opponent on Sunday night. If all goes well, I know that bigger things are coming. I want to give fans fights that they’ll remember for years to come. I’m that guy who wants to make great fights. “I know that I’m facing a tough fighter from Mexico. I always know that these guys come with a real hunger to win. I’ve prepared very well and I’m ready to put on a show Sunday night. “I’ve taken advantage of opportunities given to me in the past and I’m looking to take advantage of every one I get. I’m going to show off my abilities on Sunday. “I’m in a good state of mind right now. I’ve been working for several months and I really feel 100 percent physically. “This is going to be a good fight. He’s going to come with the will to win. I’ll be smart and use my abilities. I’ve been working on some new things and Sunday will be a glimpse of what’s left to come. “More than anything I think that the fans can expect fireworks. I’m fighting a crafty veteran guy in Klimov who has fought the best. He’s fought guys like Terrence Crawford and Jose Pedraza. Our styles are meant for each other and I think they’re going to clash. The fans are going to be the real winners. “I say yes to every challenge they put in front of me. This is a big test. I feel confident in my training and I believe I can get past Klimov. I think getting this win shows that I’m ready to fight any champion in the lightweight division. “I train 100 percent every time. I had a smooth camp and I’m ready to go. My work ethic is my secret weapon. I’m a believer that fights are won in the gym. “I fight for the people every time I’m in the ring. They’re paying money to see a great fight and I want them to get their money’s worth. “I’m excited because I have a great team behind me with Richard Schaefer, Abner Mares and Robert Garcia. I feel strong and ready for this fight. “I’m so happy to be fighting in Los Angeles, because it’s like a second Mexico. I hope the fans all come out to see me because I’m going to work hard to be the next Mexican superstar. “I’m going to keep working and getting stronger and better. I have to be consistent and have good training camps so I can reach my goals. “Training with Robert Garcia has been great. He has had a lot of champions and I hope that I will be next. Him and his whole family are good people and they’ve treated me like family. I’ve learned a lot already. “Joel Diaz has helped me so much with the mental side of the game. The way he speaks so passionately about the sport, he transfers that to me. I feel that belief and trust. He gives me the right words to keep me going and unleash anything I was holding back. “I work really hard at this sport. People didn’t see me when I was coming up, but It’s been a real journey. I’ve never backed down from anything. I’m proud to be a female fighter in the sport right now. Female athletes are getting more attention across the world than they ever have. “All of these young fighters we’re letting loose on Sunday are coming to fight. This won’t be ‘Dancing with the Stars’, they will come to engage and destroy. These guys all have advanced skills and I look forward to seeing them in the ring. “Misael Rodriguez is a very charismatic person. He’s an entertainer and a fighter. With Abner behind him as a manager and Robert Garcia as a trainer, this is a kid who wants to surround himself with the best. Watching his career will be very exciting. “Josesito had his biggest win, over Victor Ortiz, right across the street at Staples Center and he is ready for the next step in his career in a stacked welterweight division. I also believe that Alejandro Luna is on the cusp of being in world title contention if he can get through Klimov on Sunday. In addition, you have one of the most charismatic female stars in Maricela Cornejo going along with an incredible group of young talent making their debuts on Sunday. “With this new young class of fighters coming out of Southern California combined with world champions like Leo Santa Cruz, Mikey Garcia and Abner Mares, Los Angeles is on its way to being the fight capital of the world again. “I’m nervous and excited to see Misael in the ring on Sunday. He’s a fighter with a lot of heart and the desire to become a world champion just like I was coming out of the Olympics. “Our goal is to have Misael fight six times this year. We’re going to go step-by-step to make him a champion. “Misael is the future. He brings excitement and he’s likeable. He’s in a great weight class and the team he has behind him will get him to where he needs to go. Fans can live stream the fights on FOX Sports GO, available in English or Spanish through the FS1 or FOX Deportes feeds. The fights are available on desktop at FOXSportsGO.com and through the app store, or connected devices including Apple TV, Android TV, Fire TV, Xbox One and Roku. In addition, all programs are also available on FOX Sports on SiriusXM channel 83 on satellite radios and on the SiriusXM app. The Premier Boxing Champions series rolled into April with a hotly contested match between Edner Cherry and Omar Douglas on FS1 “TOE-TO-TOE TUESDAYS” last night and will continue with an outstanding slate of shows, featuring matches in some of the deepest divisions in boxing. The impressive run started with Cherry besting Douglas in a close and competitive super featherweight clash from Sands Bethlehem Events Center in Bethlehem, Pa., on “TOE-TO-TOE TUESDAYS “on FS1 and FOX Deportes last night. Next up, former title challenger Josesito Lopez will meet Mexico’s Saul Corral in the main event on FS1 and FOX Deportes from the Novo at L.A. Live in Los Angeles at 9:30 p.m. ET/6:30 p.m. PT on Sunday, April 9. Unbeaten lightweight contender Alejandro Luna will battle former title contender Andrey Klimov in a 10-round bout in the co-feature. Also, 2016 U.S. Olympian Karlos Balderas will make his pro debut in a six round super featherweight match. A welterweight world title eliminator between former champions Andre Berto and Shawn Porter will highlight an action-packed PBC card on SHOWTIME from Barclays Center in Brooklyn at 9 p.m. ET/6 p.m. PT on Saturday, April 22. Undefeated 154-pound champion Jermell Charlo will defend his title against top contender Charles Hatley in the co-feature. Also in action is heavyweight title contender Luis “The Real King Kong” Ortiz taking on rugged veteran Derric Rossy. Exciting contenders Oscar Molina and Levan Ghvamichava will square-off in the main event, while rising star Brandon Figueroa also enters the ring, in an action-packed “TOE-TO-TOE TUESDAYS” show on FS1 and FOX Deportes at 9 p.m. ET/6 p.m. PT on April 25. Beibut Shumenov defends his cruiserweight title against Yunier Dorticos while Carlos Zambrano will battle Claudio Marrero in a featherweight showdown on FS1 and FOX Deportes at 10 p.m. ET/7 p.m. PT from Sam’s Town Live in Las Vegas on Saturday, April 29. The PBC schedule for May promises to be just as jam-packed with exciting matches. Stay tuned for upcoming announcements. Premier Boxing Champions is a live boxing series created for TV and cable by Haymon Sports, LLC. The series features the greatest array of international boxing talent in all weight divisions, with fighters representing over 10 countries including the United States and Mexico. From former Olympians to Champions of all nationalities, the series can be seen on over 10 networks in the U.S., Canada, Mexico and the U.K.